Christians can see that the relationship between man and woman is fundamental. The relationship is always unitive, and always open to the possibility of life, according to nature's design. 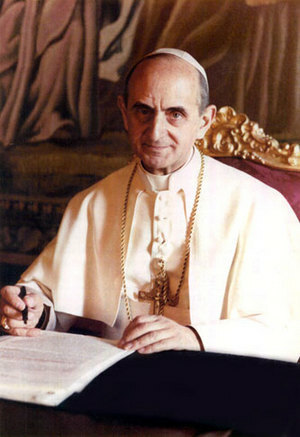 Pope Paul VI, did not teach something new in 1968, but merely reaffirmed what the Church has always taught. We are seeing today, the bitter fruits of not listening to the Pope. Women degraded, families destroyed, men brutalized. Abortion has never been so rampant, with women on the Pill having an average of THREE chemical abortions per annum. Truly we live in a "culture" of death. While the CC cannot change Catholic Doctrine to suit a secular world, a Destroyer Pope un-canonically elected will certainly attempt to do so. Only the silent Cardinals/Bishops can stymie the Marxist agenda rampant in the Vatican & Episcopates. The problem of a un-canonical "pope" (an anti-pope), and we have had many over 2000 years, is always dealt with by a future real Pope. This means that Pope Francis is the Pope.